No, it won’t. The only thing that may be powerful in this context is the wind which will drive the contraptions when the weather suits. At other times, they are useless as replacement for proper power stations. “Fill the gap of Nuclear”, for 20% to 30% of the time. What do we do for the other 70-80% of the time? Sadly, such ignorant and inaccurate drivel is not confined to the Guardian and the BBC. Other outlets – Silly Jilly at the Telegraph – never question the stupidity presented to them. There is also this Dutch study that suggests employing dual use for the windmill platforms to help reduce costs. Basically cost savings in a combined offshore Multi-Use Platform (MUP), based on the example of a virtual offshore wind-mussel-farm (OWMF) enterprise. How many potential mussel farmers are there who would be willing to pay to farm around these dangerous monstrosities? These costs are not merely a matter of a paint job. They involve sophisticated application of highly abrasive resistant metal/ ceramic coatings. The turbine blades are constantly subjected to very high air velocities akin to the grit blasting process; so suffer rapid erosion of not treated with these coatings. This affects the efficiency of the blades. Offshore the addition of salt particals exacerbates the problem. Hence this large increase in Costs, quite apart from the practicalities of operating in severe conditions , should any repairs to the coating be required. With experience in these matters; if I were asked to repair the coating on an offshore turbine blade I would run a mile. If people recall the old rude poem from childhood days, The Good Ship Venus, they will know the job that the first mate, Carter, had. I hope this lot are hiring an army of Carters for when the wind doesn’t blow. As I remember (distantly), he was third mate, maybe my memory or he may have been promoted! The Yorkshire Post business section today gives a quarter page to Lord Haskins for a Humber “Energy Estuary” advertorial. Haskins is a subsidy sucker, his farmland takes £81K from th EU pa , for a start. This should open a few eyes to the real availability of wind power. Whether you have one small or a thousand huge turbines the output when there is no wind is still zero. Fortunately they’ll be installed in phases so they’ll be able to find out for themselves…..however I don’t think it will make a difference. The maintenance cost of this farm when completed will be astronomical. What is the difference between “price” and “strike price”? Strike price is the contract price that is guaranteed by govt. Is it coincidental that OFGEM has raised the energy price cap for consumers this week, despite a fall in oil and gas prices? Silly me, I shouldn’t need to ask. We are mugs. And we are being mugged. By our own Government! Didn’t the ridiculous Gummer say that onshore wind is the cheapest generator of electricity? Has he pronounced on offshore? Will he be caught out lying again? 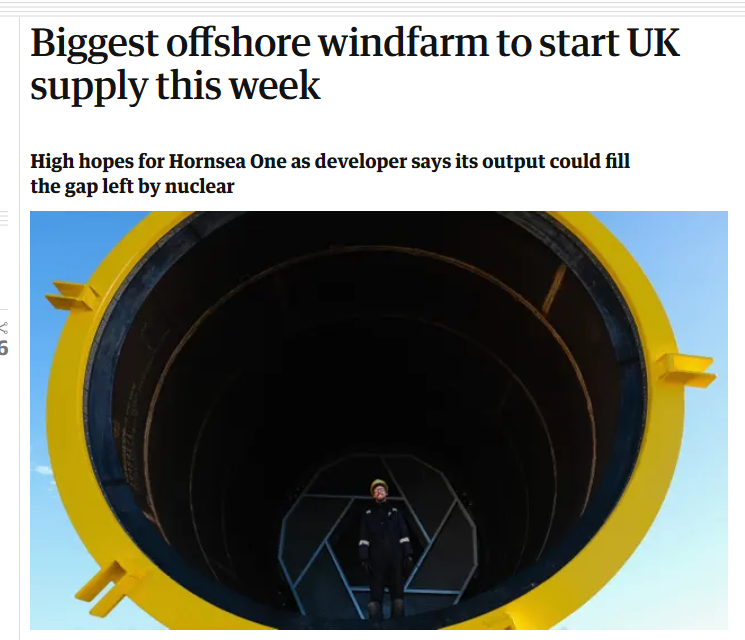 Unfortunately Claire Perry will believe these lies and will carry on with the insane and unaffordable offshore wind policy. I noted that the media commentary on the increased “capped” electricity bills blamed the price rises on increased fossil fuel prices, with no mention of the astronomical prices being paid for increasing amounts of offshore wind. Currently, prices seem to be in free fall at around 45 p/therm after a spike to 80p/therm last summer. Gas prices tend to set electricity prices most of the time. There is noting to suggest that gas prices are exceptional. Even at 80p/therm, that’s under 3p/kWh for gas, and wholesale electricity for just over 5p/kWh or £50/MWh from a CCGT plant. Wholesale costs of course do include expensive wind and the rising cost of the transmission network to service the distant offshore windfarms etc. In short, the claim looks to be b******ks. combined tariffs for gas/elec’ will go up again by 10%………….inflation is 2.1 there will be a minor kerfuffle but the real problem will not be addressed – the insane costs of ruinables. for the cost of this monster white elephant! Ooh look, we could probably build two lean burn efficient, reliable, easily serviceable coal fired stations and 3.6 GW (based on Kingsnorth figures), you know, just like the Japanese are doing, coal it’s the easy answer, it’s the logical answer, it’s the best answer and that’s why the BEIS/green blobettes ain’t doing it, its far too simple for them. 18,600x(13)^3×1.225/2 W, or almost exactly 25MW. The power that can be extracted is 16/27ths of this because of Betz’ Law, so 14.83MW. Against that 7MW is not impressive – less than 50% efficient – and this will be more or less the maximum efficiency: at higher wind speeds, efficiency falls because the generator cannot produce more. If the real speed for maximum power is 15 m/sec, then the effective maximum efficiency might be little over 30%. I did note they have since developed an 8MW version with the same blade diameter: the problems seem to be in upsizing the generator because of limitations in the magnetic field density of the permanent magnets, even with lots of Chinese Neodymium, and weight limits on the turbine. However, it only produces 10% more power on average, instead of the 14.3% you might hope for. thank you for that reall good stuff, and much appreciated! dear Lord, the tears of frustration are beginning to well…………. … plus of course it won’t be generating so much as a sausage if there’s no wind – i. e. when it’s most needed. “As the Sector Champion for Offshore Wind, I will be articulating the industry’s vision of what is possible between now and 2030 to Ministers. We need to retain our position as the number one destination for offshore wind investment. We can secure £48bn of investment in UK infrastructure, increasing the number of jobs in the offshore wind industry from 11,000 today to 27,000 by the end of the next decade. By that time, offshore wind can be generating one-third of the UK’s electricity, with 30 gigawatts of capacity installed. Followed by more of the same. “The UK offshore wind industry has committed to work with the government on a transformative Sector Deal, which by 2030 could deliver thousands of additional skilled jobs in coastal areas, and billions of pounds worth of export opportunities. The offshore wind industry’s vision for 2030 includes £48Bn (US$67Bn) in investment in UK infrastructure; a five-fold increase in export value, to £2.6Bn a year; 27,000 skilled jobs across the UK (up from 11,000 today) mainly in coastal areas; and £2.4Bn a year reduction in total electricity system costs, reducing costs to consumers. The offshore wind industry aims to generate one third of the UK’s electricity from offshore wind by 2030. This scaled-up ambition, coupled with the government’s Clean Growth Strategy, means the industry will more than double its capacity from 13 GW deployed or contracted today, to 30 GW by 2030. This additional capacity will not only generate affordable and clean electricity for UK business and consumers, it will also have a direct impact on supply chain productivity and efficiency, benefiting other sectors as well as the UK’s ability to export. Conflict of interest? What’s that m’lud? I found these snippets a few weeks ago looking around Offshore Renewable Energy Catapult, the company of which she is a non-exec director. “By the end of 2018, installed offshore wind power capacity will reach a total of 30.2GW, with 22.9GW of generation in Europe and 7.3GW across the rest of the world. The UK remains the global leader in offshore wind, with a total capacity of 6,385MW and an additional capacity of 3.2GW entering operation by 2020. As the industry’s generation capacity continues to grow, so does the need for developing reliable, high-capacity transmission cable technologies. Subsea power cable failure is frequently reported as an issue for offshore wind farm operators. Such failures are reported to account for 75-80% of the total cost of offshore wind insurance claims – in comparison, cabling makes up only around 9% of the overall cost of an offshore wind farm. Interesting data. From 2014 to 2017 inclusive UK wind farms generated 159.2TWh. Another way to look at it is that 1.97TWh is worth £305 million at 155 £/MWh. Not sure what the Baroness’ savings figure is relative to – an all solar solution perhaps? This will prove to be the death knell of migrating birds, such as Bewick swans. The Green lobby never mention the cost in wildlife though. Funny that. There’s no problem with lack of wind, it’s all been sorted. This looks like clickbait spam to me. Perhaps the comment or at least its link should be deleted? It doesn’t… The link was an attempt at mocking ridicule of the wind turbine fiasco, albeit poorly executed. The original photo showed two Chinooks over the offshore wind farm which I posited as what was being done to keep the sails turning. Sorry it fell flat with you. £3.36 billion for intermittent electricity to 1 million homes for 25 years is equivalent to £134.40 per annum per home. In 15 years, the NOAK BWRX-300 SMR from GE-Hitachi will be available at £462 million and will supply 24/7 electricity to 625,550 homes for 60 years. That’s equivalent to £12.30 per annum per home. 10.9X more per annum per home for a pathetic product that will forever require fossil-fuelled backup. 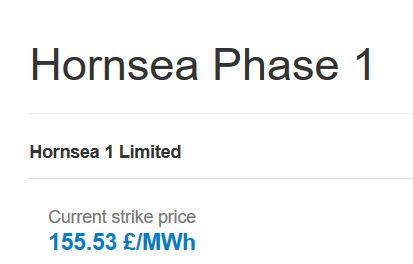 The wholesale electricity price is about £55.53/MWh, so we’ll be contributing £100/MWh in subsidies to Hornsea 1. In total, over its 15 years of subsidy, it will amount to £15.14 billion. Hinkley, at £92.50/MWh, for its 35 years of subsidy will receive £32.65 billion. But Hinkley will deliver 15.55X more MWh of electricity for 2.16X the subsidy.